Smiling makes us feel good. When we smile, the neurotransmitters in our brain are activated and release dopamine, endorphins, and serotonin. This helps to relax our bodies, lower our heart rates, relieve stress and boost mood. A Smile = Confidence. This may relate to the fact that people who smile more often are seen as successful. If you show confidence through your smile, you are more likely to be perceived as confident in an interview situation, on the job or just walking down the street. You will also be less stressed and feel more confident just by wearing a smile more often. Smiling makes us appear more attractive. Science shows a healthy smile makes you appear more attractive to others. It can also make you appear more intelligent, interesting, and successful. Make a good first impression. People associate a more positive description to those who have a smile with straight teeth than those who have crooked teeth. Those with straight teeth are 21% more likely to be seen as happy, 47% more likely to be viewed as healthy and 38% more likely to be perceived as smart. The same study reposts that nearly 1/3 of Americans say the first facial feature they notice in other person, is their teeth, and 25% say it is also the feature they remember most after meeting someone. Smiling can extend our lives or at least make them happier. There was a study of baseball cards that found that the players with big smiles on their baseball mugs lived, on average, seven years longer than those who didn’t smile. A similar study followed women in yearbook photos. It found those who smiled were happier, had happier marriages, and were more successful. 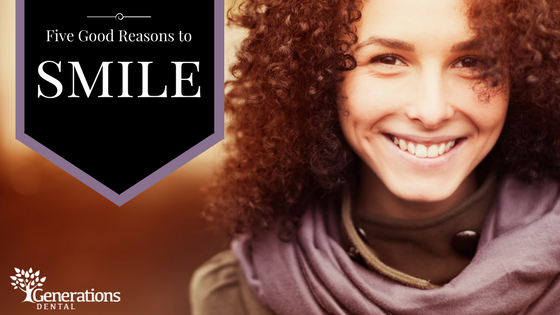 No matter the reason, we want you to smile bigger and more often. Let the staff at Generations Dental help you achieve your best smile.